This Wine Is From There…Seriously?!! I love Cabernet Franc. If you are a (sometimes) regular reader of my blog, you know that I talk of this Big Daddy often. Highly underrated, he may be tough to understand, but if treated kindly and made well, there are some stellar Cab Francs out there. I’d never turn down a glass, should I be offered one, but then again, the offering tends to be from the Loire Valley in France. Sometimes I get lucky when I work at the store and happen to be on shift when a rep comes in to have us sample some wine. I love these opportunities because the store manager asks my opinion, and I know it counts, because in the next few weeks, I will then see these wines grace the shelves in the store, and know that my rating on a particular wine counted for something. Finca Los Aljibes is part of the estate of the same name located in Chinchilla de Montearagon, and part of the Castilla (Le Mancha) wine growing region of Spain. That’s almost in the middle of the country! And it’s not even rated a DO wine. This one is actually in the Vino de la Tierra region, one step below the Denominacien de Origen. But don’t let that dissaude you from trying this wine. 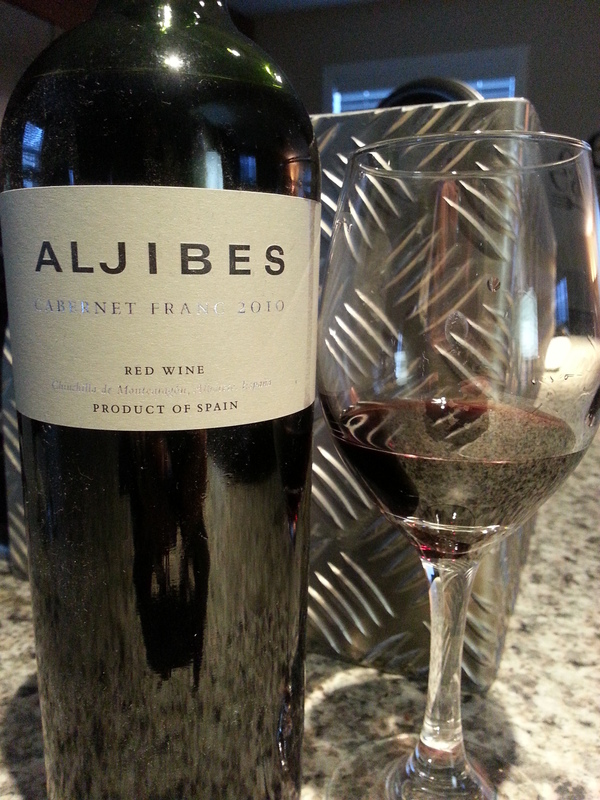 According to the folks at Finca Los Aljibes, this grape has perfectly adapted to the terroir, and as a result, has shown success since its launch in 2009. One year later, and this wine is incredible. A sweet little surprise from Spain...nose of plums, earth, black licorice and hints of violet with a balanced palate of sour black cherry, more licorice and more plums. Outstanding! I’m not one to pick wines based on points, but most consumers are. Robert Parker and the Wine Advocate liked it, therefore you should too! (Not the CF specifically, but other Aljibes wines) But in this case, I’M saying you should like THIS wine! It IS a Cabernet Franc after all, and is a lovely little bottle to add to your collection. About $30 on the shelf! Cheers! This entry was posted in Education, Tasting, Varietals, wine and tagged Cabernet Franc, DO, La Mancha, Spain, unusual, varietal, Vino de la Tierra. Bookmark the permalink.